Charles Dumbreck was born in 1700 and was a Miller in Rothes, Scotland. He married Isobel Mitchell at Dundurcus on the 26th October 1726. Charles Dumbreck died in 1769. Their children are listed in the links at the top of this page. John Dumbreck born May 23rd 1736 continues the Dumbreck family line. Thomas 1731 and James 1727 continue the Dunbrack family line. 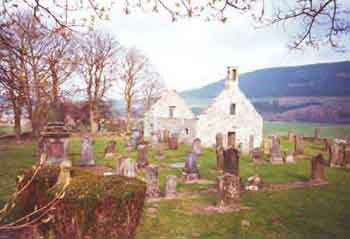 In 1782 the Parish Church of Dundurcas, the ruin of which still stands in Dundurcas Churchyard, was closed, the parish being suppressed by order of the Boundaries Commission, and the greater part of it being annexed to the parish of Rothes, the remainder to Boharm. It is recorded that two slaters came to remove the roof from the old church, as a means of ending the activities of "an insane preacher," who continued service there after the union of the parish with Rothes. The women of the parish swooped down upon the slaters and stoned them from the churchyard. They tried to escape by wading across the Spey, in order to return to Keith, but one was drowned in the get-away.